WASHINGTON DC – A federal court found this week that people born in Vermont are not guaranteed U.S. citizenship by the Constitution. After a lengthy debate regarding the citizenship rights of people born in U.S. territories, which everyone agreed were non-existent, the discussion moved to the states themselves, and specifically those states which were not part of the original thirteen colonies. The court ruled that when the 14th amendment opened up citizenship to “all persons born or naturalized in the United States,” it was only referring to the original United States, and not the Johnny-come-lately states starting with Vermont as state number fourteen. President Trump was golfing and could not be reached for comment. 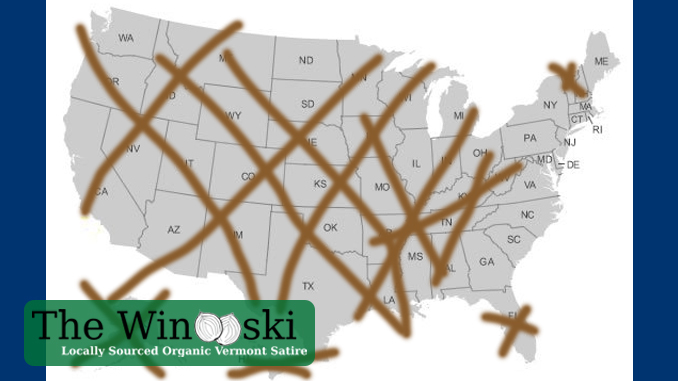 Since both New York and New Hampshire claimed the area that became Vermont, shouldn’t it follow that every Vermont citizen also has a claim to citizenship in both of those states, as well as in Vermont, and should be entitled to vote in all three states?